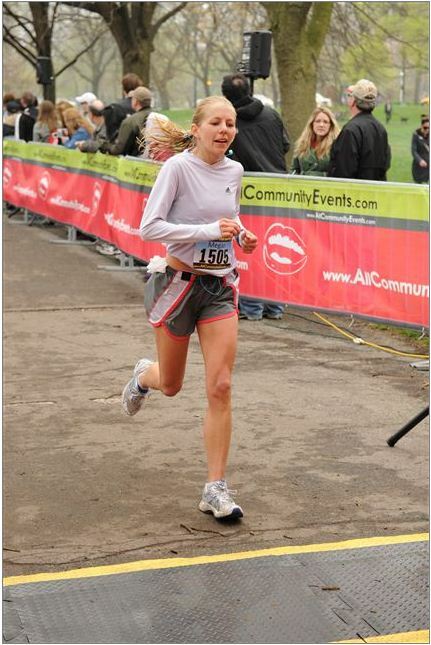 A few weeks ago, my cousin Michelle broke her leg while competing in a relay triathlon. 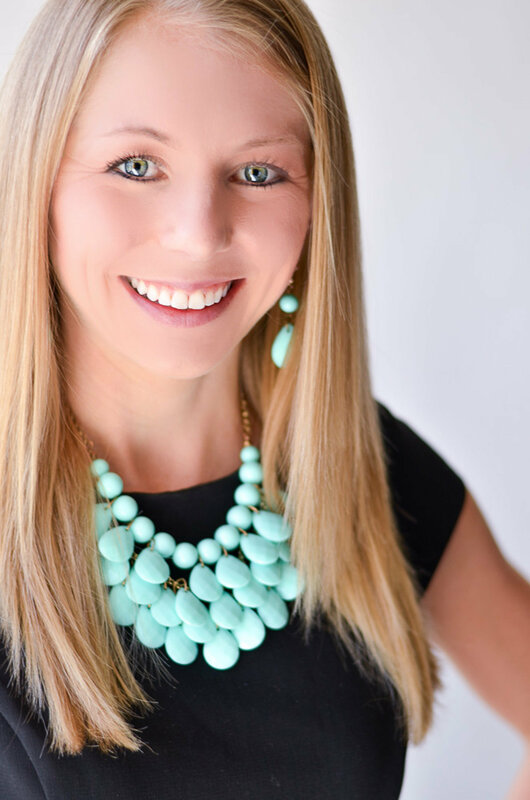 I felt terrible for her, and really wanted to help, but I didn’t think there was anything I could do … until she asked me to make her a training plan!! Her determination to keep her arms and abs toned and her fitness levels high was inspiring, but I certainly didn’t want to hurt her! So I did some research, tested out the moves on myself, and put together a two-part training plan for her. She liked it, stayed safe, and even said she was “so sore” after the workouts! I was thrilled to be able to help Michelle, but I didn’t even think about sharing the workouts with you all until I was recently looking for a quick, at-home strength workout that would get my heart rate up and work my arms. I had a longer run the next day, and I didn’t want to wear out my legs, so I started thinking what I could do … of course!!! Michelle’s workout! (Sometimes I’m a little slow :)). This workout is designed to put absolutely NO pressure on the legs, so it’s great for those with leg or knee injuries*, but it’s also great for those without injuries who just want to work their arms and abs! You see, running is a great strengthening workout for my legs, and I usually fit in some planks or ab work after my runs (I recently started doing my Flat Abs in 5 Minutes workout again, and it’s awesome!! Go check it out if you haven’t yet!). But the truth is, aside from my at-home (or hotel) circuit workouts, I don’t work my arms as much as I’d like to. *I am not a trainer, doctor, or physical therapist, so please consult with your doctor if you do actually have a leg injury. So tell me in the comments … Do you usually work one part of the body at a time, or do you prefer circuit workouts? What’s the best workout you’ve done this week so far? thank you thank you thank you! You answered my prayers! I’ve had a hard time finding upper body exercises that don’t hurt my leg. This workout is absolutely perfect. Pinned! I am here to say that I love the exercises!! Megan was kind enough to share some of them with me when she knew I was injured and I was so grateful!! Thanks Sara – I’m glad you got to enjoy them, too! So sad how so many people I care about got injured at the same time :(. But your dedication to your arms and abs is impressive, as I’ve seen in your weekly recaps! Thanks Megan! Let’s catch up this weekend! I can’t wait! Hope you’re doing well! This is GREAT, Megan! I literally just planned an arm workout for the gym tomorrow morning and I wasn’t sure what I was going to do. Any idea about how long this one should take? This will be a perfect rest for my knee! I’m so glad it will help, Amy! It should be about 25 minutes, give or take a bit. Don’t be silly, Gary, you will be outrunning Kevin and I for decades to come :). I really think that runners especially can benefit from a little upper body strength – we focus so much on the legs and forget about the other half! After my walk down the JMO road, I’m all about trying this circuit. Thank you for encouraging the arms and abs – I HOPE it helps my golf swing?? Way to go for walking AND doing arm weights! As you know, I’m REALLY not a golf expert, so I have no idea if this will help … but it sure can’t hurt!! 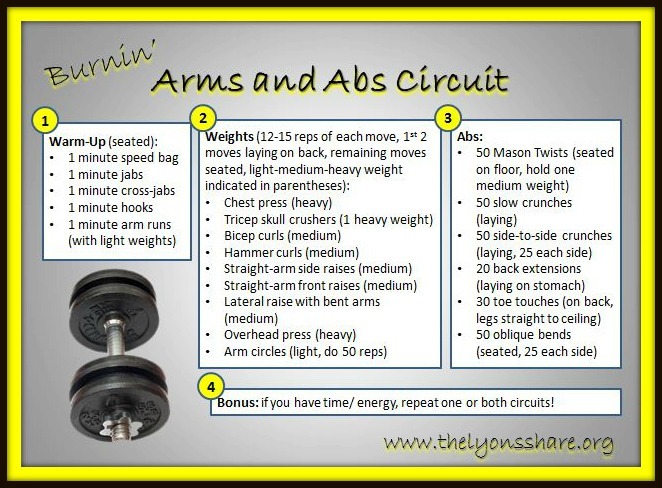 i love combining arms and abs! thank you for this great workout! I’m glad you like it Caitlin! I was just thinking I should workout my arms tonight at the gym! I am pretty sure my arms will be jelly after this routine! I hope you like it! Mine were total jelly after the workout, but then I was surprisingly not sore the next day … I was kinda bummed :). Let me know how it goes! Yes! Most exercises are harder if you go slower! If only running slower were harder :). It’s a great tip, though – I only have 10 lb weights max at home, so if I feel I needed to go harder I could just go slower. Thanks! Umm this is an immediate print!! Haha I’ve been looking for a good arm workout AND ab workout so this is perfect. Ab workouts are so brutal but I’m always happy when I get them done. Good for you, Laurie! Way to stay balanced. As I was erasing my whiteboards the other day I saw my upper arms flap around. Gross. Time to try this workout!! Katie, you are NOT gross!!! Almost everyone has a little arm “flap” (isn’t that word just unappealing? ), but strength training is the ONLY way to get rid of it. Unfortunately, that’s just a thing that happens to women unless we’re super diligent about strength training :(. Hope you like the workout! Thanks so much for sharing this workout. Wish I had someone to create something like this for me when I injured my foot and couldn’t run. Saving this for a rainy day, but fingers crossed that an injury won’t prevent me from running ever again.